, a dramatic and miscellaneous writer, a native of Ireland, was born on the banks of the lake of Killarney, in 1739. His father was a gentleman of good family in that country, whose fortune being reduced by a series of misfortunes, he was obliged to repair to Dublin, in order to endeavour to support himself by his personal industry. He gave our author, however, some school education; but the narrowness of his finances would not permit him to indulge his son’s natural propensity to study, by placing him in the higher schools of Dublin. He was therefore bound apprentice to 3j stay-maker, an employment but ill suited to his inclination; yet continued with his master till the expiration of his apprenticeship, and then set out for London, in 1760, in order to procure a livelihood by his business. This, however, he found very difficult, and was soon reduced to the utmost distress for the means of subsistence. In this forlorn situation, a stranger, and friendless, he used sometimes to endeavour to forget his misfortunes, and passed some of his heavy hours at a public-house in Russel-street, Covent-garden, much resorted to by the younger players. Having an uncommon share of good-humour, and being lively, cheerful, and engaging in his behaviour, he soon attracted the notice, not only of these minor wits, but of a set of honest tradesmen who frequented that house every evening, and who were much entertained with his conversation. 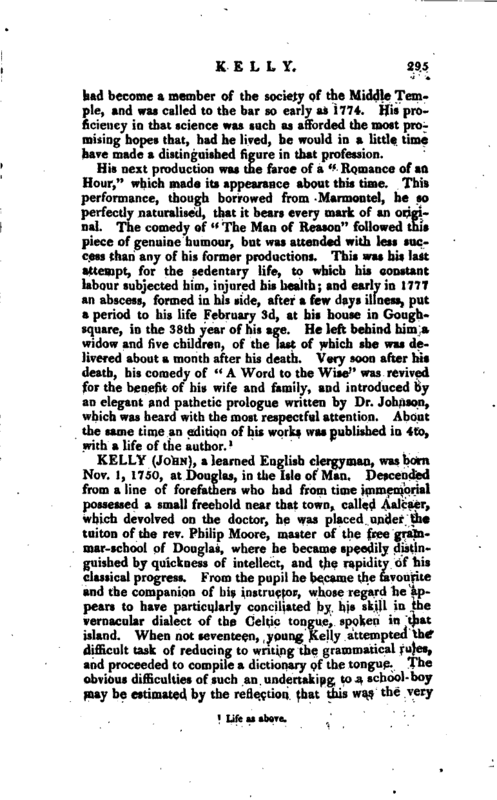 In a little time Mr. Kelly became so well acquainted with the characters of the club, that he was enabled to give a humorous description of them in one of the daily papers; and the likenesses were so well executed as to draw their attention, and excite their curiosity to discover the author. Their suspicions soon fixed on Mr. Kelly, and from that time he became distinguished among them as a man of parts and consideration. 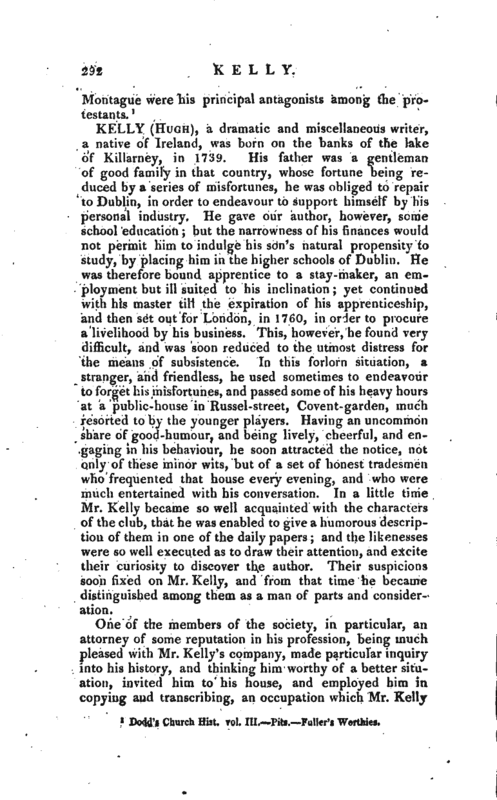 One of the members of the society, in particular, an attorney of some reputation in his profession, being much pleased with Mr. Kelly’s company, made particular inquiry into his history, and thinking him worthy of a better situation, invited him to his house, and employed him in copying and transcribing, an occupation which Mr. Kelly | prosecuted with so much assiduity, that he earned about three guineas a week; an income which, compared to what he had been hitherto able to procure, might be deemed affluent. But this employment, though profitable, could not long be agreeable to a man of his lively turn of mind. From his accidental acquaintance with some booksellers, he, in 1762, became the editor of the “Lady’s Museum,” the “Court Magazine,” and other periodical publications, in which he wrote so many original essays, and pieces of poetry, that his fame was quickly spread, and he now found himself fully employed in various branches of periodical literature; in the prosecution of which he exerted himself with the most unwearied industry, being then lately married, and having an increasing family, whose sole dependence was upon his personal labour. About this time he began to write many political pamphlets, and among the rest “A Vindication of Mr. Pitt’s Administration,” which lord Chesterfield makes honourable mention of in the second volume of his letters, Letter 178. 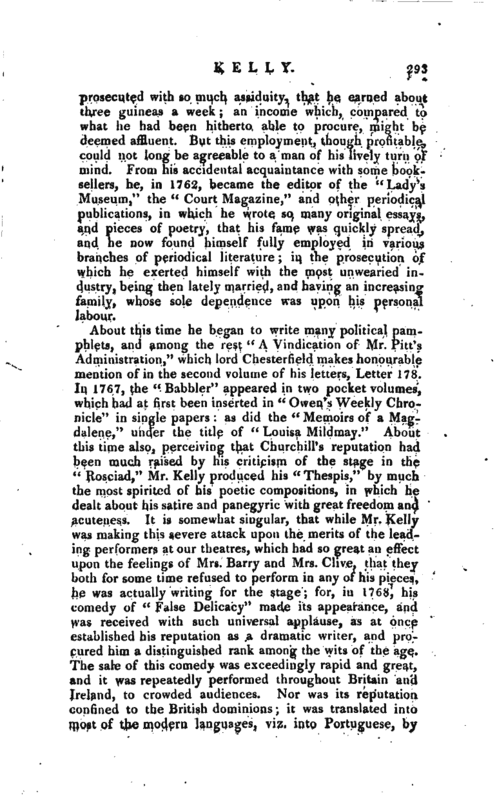 Jn 1767, the “Babbler” appeared in two pocket volumes, which had at first been inserted in “Owen’s Weekly Chronicle” in single papers: as did the “Memoirs of a Magdalene,” under the title of “Louisa Mildmay.” About this time also, perceiving that Churchill’s reputation had been much raised by his criticism of the stage in the “Rosciad,” Mr. Kelly produced his “Thespis,” by much the most spirited of his poetic compositions, in which he dealt about his satire and panegyric with great freedom and acuteness. It is somewhat singular, that while Mr. Kelly was making this severe attack upon the merits of the leading performers at our theatres, which had so great an effect upon the feelings of Mrs. Barry and Mrs. Clive, that they both for some time refused to perform in any of his pieces, he was actually writing for the stage; for, in 1768, his comedy of “False Delicacy” made its appearance, and was received with such universal applause, as at once established his reputation as a dramatic writer, and procured him a distinguished rank among the wits of the age. The sale of this comedy was exceedingly rapid and great, and it was repeatedly performed throughout Britain and Ireland, to crowded audiences. Nor was its reputation confined to the British dominions; it was translated into most of the modern languages, viz. into Portuguese, by | command of the marquis de Pombal, and acted with great applause at the public theatre at Lisbon into French by the celebrated madame Ricoboni into the same language by another hand, at the Hague into Italian at Paris, where it was acted at the Theatre de la Comedie Italienne and into German. 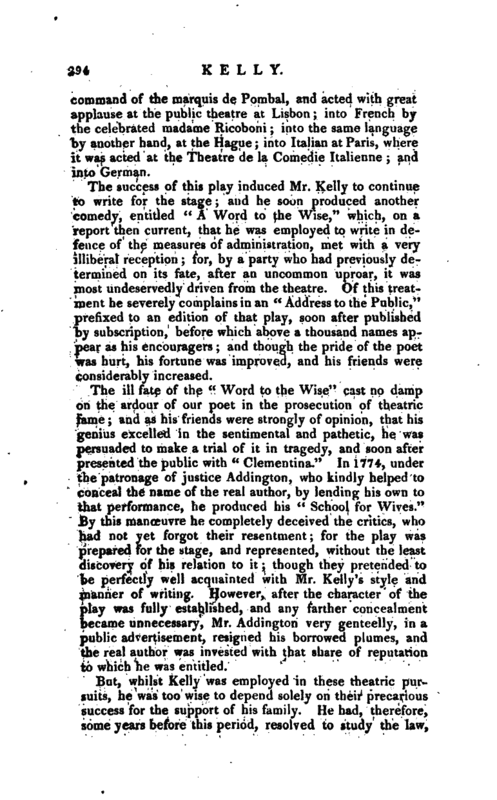 The success of this play induced Mr. Kelly to continue to write for the stage; and he soon produced another comedy, entitled “A Word to the Wise,” which, on a report then current, that he was employed to write in defence of the measures of administration, met with a very illiberal reception; for, by a party who had previously determined on its fate, after an uncommon uproar, it was most undeservedly driven from the theatre. Of this treatment he severely complains in an “Address to the Public,” prefixed to an edition of that play, soon after published by subscription, before which above a thousand names appear as his encouragers; and though the pride of the poet was hurt, his fortune was improved, and his friends were considerably increased. The ill fate of the “Word to the Wise” cast no damp on the ardour of our poet in the prosecution of theatric fame; and as his friends were strongly of opinion, that his genius excelled in the sentimental and pathetic, he was persuaded to make a trial of it in tragedy, and soon after presented the public with “Clementina.” In 1774, uqder the patronage of justice Addington, who kindly helped to conceal the name of the real author, by lending his own to that performance, he produced his “School for Wives.” By this manoeuvre he completely deceived the critics, who had not yet forgot their resentment; for the play was prepared for the stage, and represented, without the least discovery of his relation to it; though they pretended to be perfectly well acquainted with Mr. Kelly’s style and manner of writing. However, after the character of the play was fully established, and any farther concealment became unnecessary, Mr. Addington very genteelly, in a public advertisement, resigned his borrowed plumes, and the real author was invested with that share of reputation to which he was entitled. But, whilst Kelly was employed in these theatric pursuits, he was too wise to depend solely on their precarious success for the support of his family. He had, therefore, some years before this period, resolved to study the law, | had become a member of the society of the Middle Temple, and was called to the bar so early as 1774. His proficiency in that science was such as afforded the most promising hopes that, had he lived, he would in a little time have made a distinguished figure in that profession.